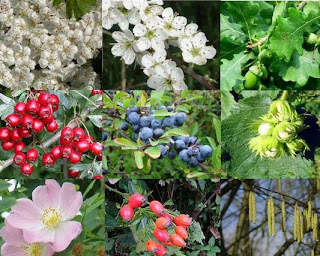 Straight away you will see all sort of lovely wildlife visiting your hedge, from small mammals and invertebrates to insects and all sorts of birds making a home there and eating the berries. Butterflies and moths will also come visiting your new boundary. You will have year round interest from foliage, blossom, flowers and berries. Planting a mixed hedge will provide a wide array of foliage which change through the seasons and some shrubs will provide berries and/or flowers to add additional interest throughout the year. Ilex aquifolium (Holly) - who can forget the wonderful holly, especially at this time of year. We all know its lovely foliage and hungry birds love its berries. Euonymus europaeus (Spindle) A favourite in our own garden, in autumn the leaves turn bright red and are followed by shocking pink and orange fruit. Viburnum opulus (Guelder rose) - this shrub will reward you with masses of white flowers in May and June and red berries in autumn. Acer campestre (Field maple) Beautiful yellow autumn colour. Rhamnus cathartica (Buckthorn) The Buckthorn providesred autumn fruits that turn to black. Lonicera periclymenum (Honeysuckle) This will add scent as well as fruit to the mix. The cheapest way to plant your hedge is to get "whips" which are available now. Winter is the best time to plant a new hedge. The whips will look teeny and not very impressive when you get them (a bit like sticks) but as soon as Spring arrives they will burst into life and will soon grow quickly. Try and source your hedge locally if possible. Prepare your area and remove any weeds, large stones or debris. Your hedge will be there for many years to come so you need to give it a good start. Dig a trench and add some compost to the bottom then plant your whips in staggered double rows, half a metre apart. You can always fill any gaps later if required. Back fill the trench with the native soil and water well and mulch. Feed your hedge once a year and be aware of dry spells when you may need to water your new hedge over the first couple of years. The best time to prune your hedge is late Autumn when you won't disturb any nesting birds. If necessary, cut back hard as this will help thicken up your hedge. And remember hedges don't just need to be used to create boundaries. You can use them within your garden to create "rooms", add privacy, create journeys and add interest to the garden. Long live the common garden hedge! If you need any more information on hedging or any form of boundary in your garden then please don't hesitate to get in touch for a chat.